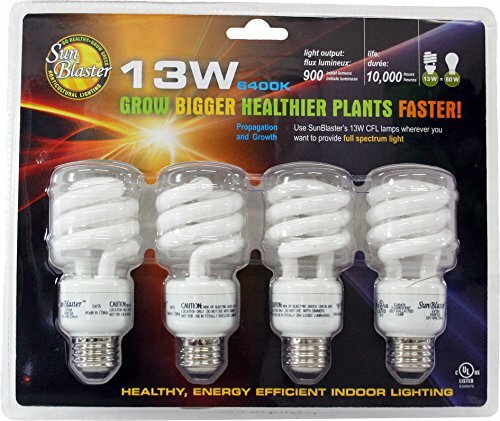 These SunBlaster CFL self ballasted lamps are excellent for a variety of indoor growing applications. Use these affordable lamps anywhere you need to replicate the sun's natural light. Easy to use, the 13 Watt lamps simply screw into any standard size light socket. The 6400K spectrum of these lamps is ideal for propagation and continued growth of most indoor plants. Grow bigger healthier plants faster! Package Dimensions 11" (L) x 2" (W) x 9.5" (H). FAQs Is fluorescent or high intensity discharge lighting best for my garden? Both fluorescent and high intensity discharge (HID) lighting sources have proven to be beneficial for plant growth. HID sources provide higher amounts of energy which aid in fruiting/flowering/blooming and greenhouse supplementation. Comparatively, fluorescent. Can I hang larger fixtures from my Jumpstart Stand? No, the stand is designed to be used only with the single T5 fixture it comes with (JST54/JST52).